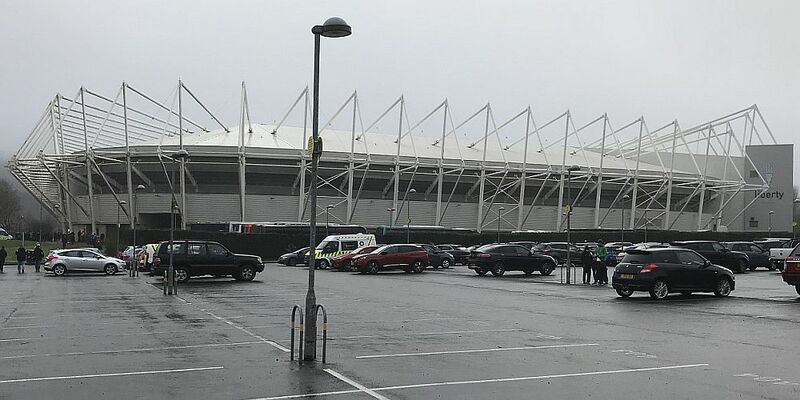 This was supposed to be our big trip of the season when we were looking forward to our under-23s winning at Colchester United to virtually clinch a place in the knock out stages of the Premier League Cup before going on to Swansea City to see what we hoped would be our first ever win at the Liberty Stadium. To say things didn’t quite work out is something of an understatement but we eventually rescued the weekend with a good stop on the way home last night, the first team having lost 1-0 at Swansea with the under-23s having taken something of a beating by 3-0 at Colchester on the previous evening. Our away trips are meticulously planned these days and so every step of the way on this one was scheduled, that was until I got a call from Burnley FC around 1:30 p.m. on Friday afternoon to advise us of a pitch inspection at Colchester. Around two hours later came news that the game was on but a diversion on the Essex roads meant our scheduled stop had to be cancelled and that left us with no option but to visit McDonald’s just across from the ground. There’s little positive I can say about the Colchester experience. Apart from his turning in an abject performance, this League Two club, who have more than once previously upset Burnley and our supporters, charged us £10 admission. I can’t believe there is anywhere else quite so expensive for football at his level but to put it into perspective, no other club we’ve visited this season have charged more than £4. Two notable absentees from the Burnley side were Oliver Younger and Dwight McNeil. We put two and two together and, incredibly, got four. Both were in the first team squad for the Swansea game on the following day. We’d booked a hotel close to Reading and the journey there from Colchester was fine; the next problem came on the following morning when we called into a Sainsbury’s for breakfast and I ordered porridge with blueberries and bananas. “We don’t have any blueberries or bananas,” I was told by some stroppy bloke taken the orders. There was a store full of the damn things but best not to argue. The rest of the drive was OK, certainly as far as the Severn Bridge. Once on the other side and we were welcomed to Cymru, the weather changed dramatically and it was pouring rain for the rest of the journey. This was our fifth visit to the Liberty Stadium. We drew the first 1-1 one back in 2008, coming close to a win before Ferrie Boddie equalised in stoppage time. Since, it’s been two 1-0 defeats and last season’s 3-2 loss. This time, and for the life of me I can’t think why, I was confident. I’m not sure where the confidence came from. We haven’t won since mid-December, they are on a terrific run and we were going into the game without the services of Tom Heaton, James Tarkowski, Phil Bardsley, Stephen Ward (although he was back on the bench), Steven Defour, Robbie Brady, Jonathan Walters and Chris Wood. What we got was a poor game in which we were just nine minutes plus a bit of stoppage time away from getting a point. That was before they scored the only goal of the game through Ki Sung-yueng. He’s not a prolific scorer and this was the first time he’d scored a goal at home since Boxing Day 2015. Our team news was as we expected. In the only change, Matt Lowton returned for the injured Bardsley with Ward taking Lowton’s place on an otherwise unchanged bench which included Aiden O’Neill although the two youngsters Younger and McNeil had a watching brief. Swansea really have had some good results recently and you might have expected them to come out all guns blazing. It wasn’t anything like that and we looked the more likely of two very average looking sides in the first half. To a large extent, Nick Pope could have sat out the first half on the touchline with the subs and it would have made little difference. They had a couple of situations but they looked a team devoid of ideas and confidence. At the other end, we did have our opportunities. With just a few minutes gone we got our first chance. Jόhann Berg Guðmundsson got down the left. His ball was met by Jeff Hendrick who saw his on target effort blocked by team mate Aaron Lennon. Their only threat came down the flanks from Jordan Ayew and our former loan player Nathan Dyer but in truth they really did not look like a team who had recently found the winning formula and further efforts from Guðmundsson and Lennon certainly gave them plenty to think about, the first of them missing target and the second, from Lennon, forcing a save, a routine one albeit, from Lukasz Fabianski. They did have one other threat, namely Martin Olsson. We all know that he’s very good at going down untouched trying to win decisions. We all remember the penalty eight years ago. So, well done Andre Marriner, a referee who didn’t fall for his latest act of cheating. Not a lot changed in the second half. They brought on new signing Andre Ayew for his second Swansea debut, this time alongside his brother Jordan, but the two opportunities of note fell our way. Ashley Barnes fired a shot just wide whilst Fabianski tipped over a good effort from Guðmundsson. With not much over a quarter of an hour remaining it looked as thought we’d get at least a point from this uninspiring game, but then both teams made a change and the game went against us. We replaced the ineffective Lennon with Scott Arfield, but Swansea brought on Tammy Abraham for Dyer and he helped turn things in their favour as they changed system. Suddenly we found ourselves struggling defensively. Pope had his first save to make when he nonchalantly kept out an effort from Jordan Ayew but there was nothing he could do soon after when Ki’s low shot found the bottom corner. We pushed forward. On came Nahki Wells and then Georges-Kévin NKoudou. It was frantic last minute stuff though and we didn’t really create a chance. We looked a beaten side by side now. We did get a few crosses into the box but didn’t cause them any problems and it was Swansea who were able to celebrate at the final whistle. Don’t get me wrong, we didn’t play well, not for a minute do I think that. It was a poor performance generally, but they weren’t very good either and for much of the game they caused us absolutely no problems whatsoever. Last week, a superb last period of the game won us a point against Manchester City, yesterday it was very much the reverse as Swansea gave it a real go and got the points they so badly need. That’s ten Premier League games without a win now, equalling our worst ever run in the four seasons we’ve enjoyed in this league. We are missing some key players and probably the two most important players, Brady and Defour, we know will be unable to play again this season. We have to get some of the others back; we are not going to be in any trouble come the end of the season but this run needs ending because we don’t want any more performances like this. After such a superb start away from home, our last three games on the road have not been good enough. That needs to change. So, a pitch inspection, a missed pub, a big defeat for the under-23s and no points for the first team, all that with news having come through that the youth team had also lost. This trip needed rescuing and rescued it was. Our planner had found us a pub stop on the journey home, the Crown at Pantygelli, in some remote place close to Abergavenny. It proved to be an excellent choice and refreshed, both food and drink wise, we then enjoyed an almost trouble free journey home, one road closure delaying us by no more than a few minutes. Embed from Getty ImagesStill no win at the Liberty though, still no win at Swansea since 1995 and not a single win in Wales since Andy Payton gave us a 1-0 victory at Wrexham almost 18 years ago which was quickly followed by a 2-1 win at Cardiff Once more we left with them singing the hymns and arias. Swansea: Lukasz Fabianski, Kyle Naughton, Mike van der Hoorn, Federico Fernandez, Alfie Mawson, Martin Olsson (Andre Ayew 59), Nathan Dyer (Tammy Abraham 74), Tom Carroll, Ki Sung-yueng, Sam Clucas, Jordan Ayew (Andy King 90). Subs not used: Kristoffer Nordfeldt, Kyle Bartley, Wayne Routledge, Luciano Narsingh. Yellow Cards: Martin Olsson, Andre Ayew. Burnley: Nick Pope, Matt Lowton, Kevin Long, Ben Mee, Charlie Taylor, Aaron Lennon (Scott Arfield 74), Jeff Hendrick, Jack Cork, Jόhann Berg Guðmundsson (Georges-Kévin NKoudou 85), Ashley Barnes, Sam Vokes (Nahki Wells 81). Subs not used: Anders Lindegaard, Stephen Ward, Aiden O’Neill, Ashley Westwood.